At about the same time I purchased my cotton yarn, which I discussed HERE, I also purchased packets of unsweetened Kool-aid to use in my yarn dyeing project. For this first experiment, I used two packets each of purple, orange and red, and three packets each of yellow and pink. This picture only shows two packets of each, just so you know. 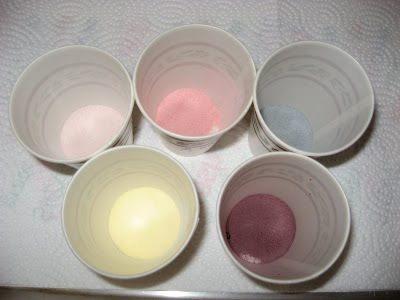 I opened the packets and dumped the powder into paper cups and labeled each cup with the number of packets and the color. 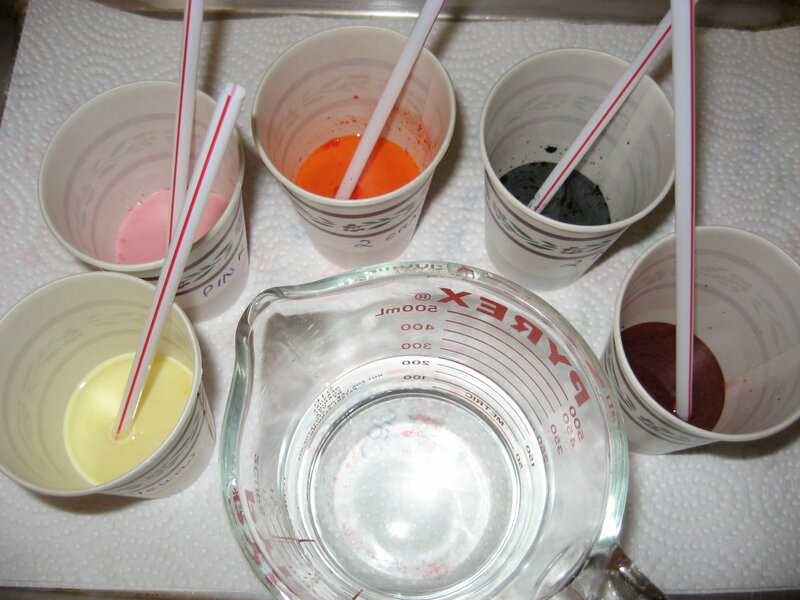 I was certain I would not be able to tell the true colors until I added water because that is what happens with the Easter egg dye every year...I always put the wrong little tablet into the wrong colored bucket...every single time! There's all the powder in the bottom of the cups. Next I added just enough warm water to each cup to be able to stir the powder in and get it to dissolve. I used straws for stirring so I could just throw them away afterwards and not have to worry about flinging drops of concentrated Kool-aid all over my clothes! 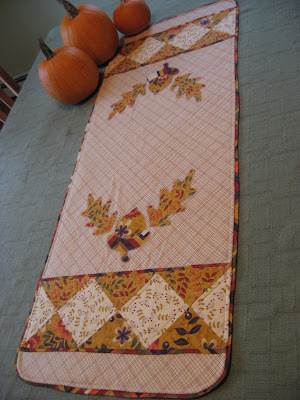 Notice also the thick layer of paper towels on the cookie sheet to absorb any spills or drops! The cookie sheet was used so that I could easily move the project around the kitchen as needed, instead of one cup at a time. Then, using the design on the cups as a guide, I filled each cup to the same level with cold water and stirred it all up. 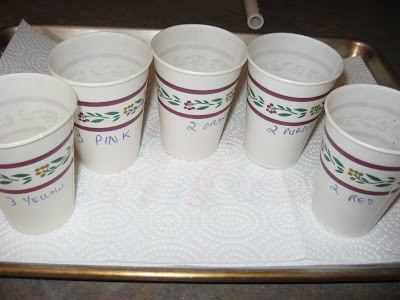 This worked out to be about six ounces of liquid in each cup when mixed. I made room in my top freezer drawer for three ice cube trays to sit in the bottom and I put them in empty. Then I took each cup of Kool-aid concentrate and, pinching the cup to make a convenient pour spout, I carefully poured the liquid into the ice cube trays. 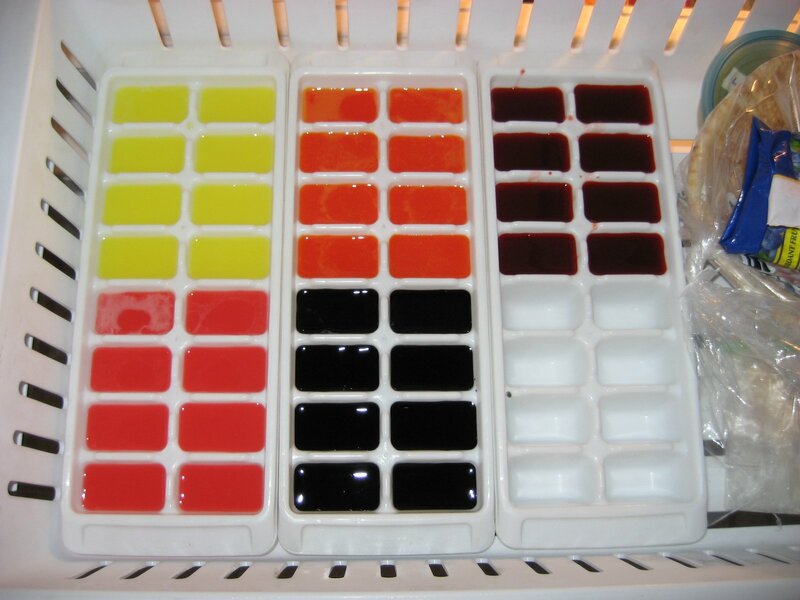 As you can see, I got eight full ice cubes from each paper cup of concentrate. Then I very carefully closed the freezer drawer and instructed everyone not to touch the refrigerator for a couple hours. 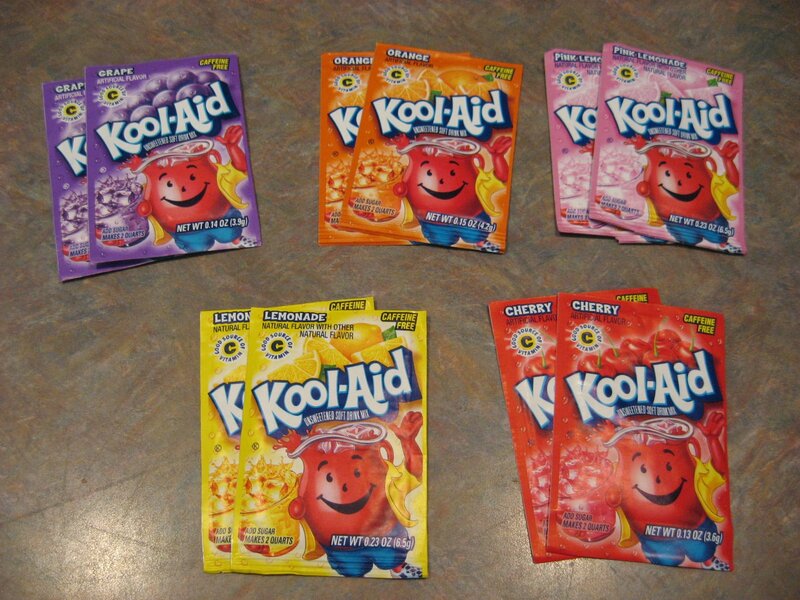 I really didn't relish the thought of having to clean up Kool-aid concentrate spills from all my frozen food! 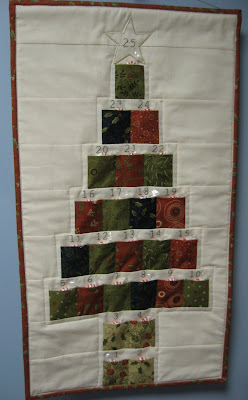 The next step will be to put the yarn and the dye together and see what happens. I am very excited to do that! Stay tuned! This is so interesting. 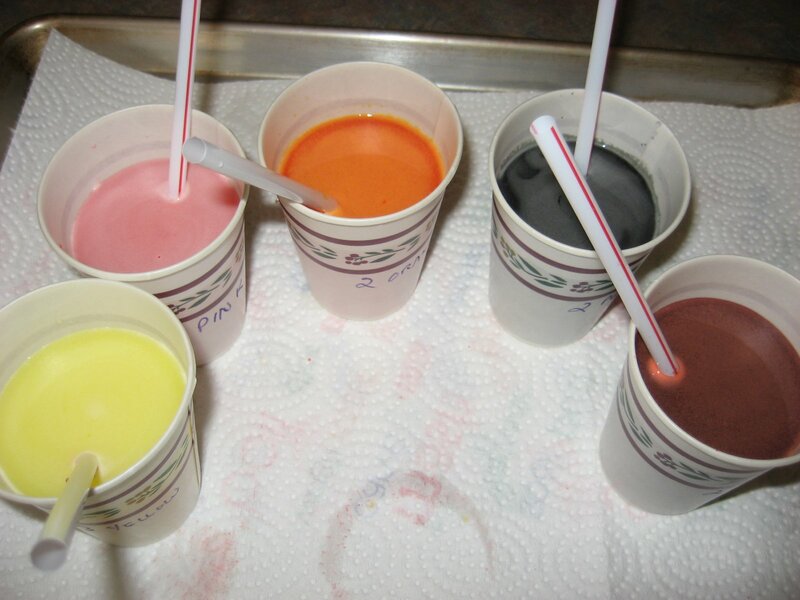 I used to hand dye wool all of the time. 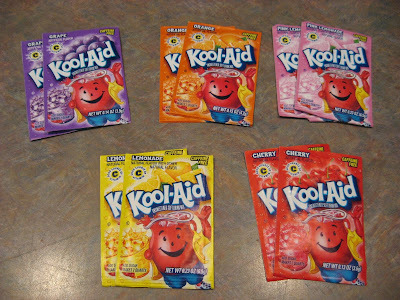 I never used Koolaid, but it sounds "cool"
This is looking pretty interesting! I find this so fascinating - am anxious to see the final results!